Chris Pratt, Will Ferrell, Will Arnett and Elizabeth Banks star in “The Lego Movie.” Photo credit: Warner Bros. Unlike many other animated movies, where the story is based on a classic fairytale or historical figure, The Lego Movie does not have the benefit of a famous story or history as a base. Instead, this adventure-comedy draws from what makes the Lego toy so popular, the ability to build entire worlds that are only limited to a person’s imagination. 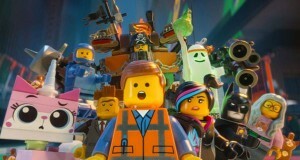 With numerous themed Lego universes, the movie includes plenty of crossover pop references (Batman, Star Wars, Lord of the Rings and Harry Potter, etc.). This gives the animators carte blanche to dream up creative worlds and mesh them together. The result is visually stunning and a lot of fun for the kids with enough references to keep adults laughing. The story opens with the evil Lord Business (Will Ferrell, Anchorman 2, 2013) taking the ultimate weapon, Kragle, from an elderly wizard Vitruvius (Morgan Freeman, Lucy, 2014), who warns Business of a Prophesy that a master builder will come and stop him. Jump eight years later, and we focus on an ordinary builder named Emmett (Chris Pratt, Delivery Man, 2013) who is just another worker bee in what resembles a purely socialist society where everyone needs to follow the guidelines, watch the same TV show, listen to the same song, and not disrupt the status quo. The planned society is maintained by Lord Business, who is now President Business, and his security forces are led by Bad Cop/Good Cop (Liam Neeson, Non-Stop, 2014). Emmett accidentally uncovers a woman named Wildstyle (Elizabeth Banks, Hunger Games 2: Catching Fire, 2013) while searching through the rubble of a construction site. He finds the ‘piece of resistance’ and Wildstyle assumes that he is the prophesied savior and rescues him from the clutches of Lord Business. Using hidden tunnels, Wildstyle and Emmett are able to move between Lego Universes and go from a city setting to the Wild West, where they find a now blind Vitruvius. After Emmett relays the news he overheard about Business planning to end the world in three days, Vitruvius calls all of the Master Builders from hiding to present Emmett as their savior and to plan their counter attack. Although Emmett does not find himself special at all, he must find a way to lead the counter attack and learn to trust his instincts when it comes to being creative. This family feature is very well done. The voice-overs are great, particularly Chris Pratt as a goofy, likeable everyman similar to his character on Parks & Recreation (2009-). Liam Neeson is excellent as a Bad Cop/Good Cop as is Will Ferrell as a control freak dictator. Morgan Freeman, who has one of the most distinctive voices in Hollywood, does an excellent job with the role of the sage wizard. Providing the laughs are Will Arnett, who does an over-the-top Batman, along with Channing Tatum and Jonah Hill as Superman and an annoying Green Latern respectively. On top of the fantastic animation, there are lessons for children regarding creativity, individualism, and having faith. This movie a must-see for all ages. Bottom-Line? The Lego Movie is an extremely creative film with great animation, a clever plot, and strong voice-overs.